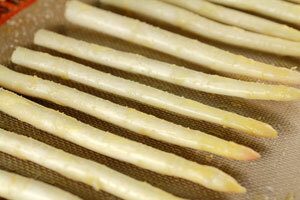 Wash the asparagus pieces, remove 1"+/- from bottom of asparagus stalk. Peel lower third of the stalk. Put the asparagus in a shallow dish and add rest of the ingredients. Coat the asparagus with oil, salt, pepper by hand and spread onto Silpat®. Space the asparagus on mat to cook properly. Bake at 500 F for 20 minutes. 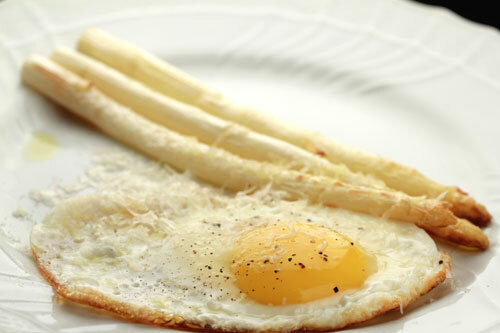 Time Saving Tip: While asparagus is baking in oven, fried egg can be made. Place olive oil in a cold skillet. Warm skillet. Test temperature of heated olive oil. When oil is hot, crack egg and gently place into center of skillet, taking care not to drop egg as oil will splash. 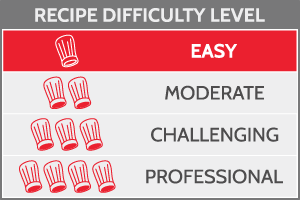 Cook until whites become opaque and the edges become crisp. Do not overcook yolk.